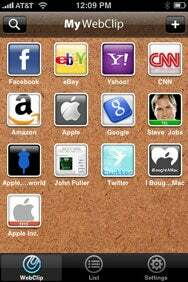 Before Apple introduced the App Store, the only non-native icons on an iPhone’s home screen were those of Web Clips—home screen links to Web-based applications you could use on your iPhone or iPod touch. Now that there are more than 50,000 native applications available for download, many of these home screens are becoming filled up to the point where the Web Clips get lost in the shuffle. Put Web Clips in Their Place: MyWebClip mimics the look of the iPhone’s home screen to give you easy access to Web Clips. To solve this problem, forYou created MyWebClip as a dedicated app for viewing and managing these online bookmarks, a task the $3 app excels at. Opening up MyWebClip presents a familiar interface to any iPhone user—a home screen with 16 icons. Many of the same organizational features of the iPhone home screen are retained in MyWebClip, such as clicking and holding for re-arranging and deleting icons, or swiping left and right for multiple pages. The interface is in many ways intuitive, as well as polished. These features make MyWebClip easy to learn and get started with. MyWebClip comes with a browser as well as options for customizing the app’s look-and-feel. The pre-packaged browser functions snappily, but doesn’t support tabbed browsing or remember your viewing history. While it isn’t a Safari replacement, it is a great supplement. One major feature to MyWebClip that the iPhone home screen doesn’t have is the ability to customize the interface. These tweaks include changing the background and icon appearance. Other nifty features include a built-in Google search bar and a bookmark back-up and restore mechanism. Avid users of iPhone web apps—and still are many, even with the abundance of native apps—will find a welcome home in MyWebClip. The straightforward app is robust, providing a smooth, enjoyable experience. While it’s not for every user, MyWebClip is certainly worth a look if you’re interested in a better method of organizing your iPhone’s icons. MyWebClip is compatible with any iPhone or iPod touch running the iPhone 2.1 software update.